Got a Virtual Doctor Yet? If Not, Now’s the TIME. A headache, rash, itchy scalp, wart, hemorrhoid, digestive issue or any other nagging health concern is a warning sign. It’s your body letting you know that something isn’t quite right. Don’t let your mind ignore your body. Pay attention to your body when you feel a symptom coming on. What do many of us do when we have a question about anything? We Google it! But don’t wait until you’re sick to decide who you want to trust. Find a healthy doctor so that you know where to turn when you want quick trustworthy answers. That way, the next time you need to rest and recover, you won’t have to waste a lot of time searching for advice from dubious sources. 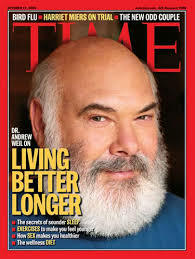 My #1 virtual doctor of choice is Dr Andrew Weil. He provides down-to-earth advice about lifestyle, diet, nature, mind and more. I never feel like he’s trying to scare me into buying his specific vitamins or gadgets to improve my health, as many other health sites do. I trust him. I sense that he genuinely wants to help people avoid illness, pharmaceuticals and drastic treatments as much as possible. He has a comforting demeanor that’s calming. In case you haven’t already met him, may I introduce you to Dr. Weil? He has written a number of books on the subject of health. His books are easy to understand even if you’ve never taken a class in nutrition or medicine. Invest in his books instead of over-the-counter drugs. You’ll be a lot better off in the long run. If you aren’t sure which one to read first, I recommend Natural Health, Natural Medicine since it provides a good overview of preventive maintenance as well as natural treatments and home remedies. He offers a Q&A section on his website. Click on the Ask Dr. Weil tab on his website and search for answers to your health concerns. If you can’t find the answer you’re looking for, you can submit a new question. He’s more likely to recommend medicinal plants rather than prescription medications. In addition to medical school, he was also trained in botany, and he traveled extensively while learning about healing practices from around the world. Most doctors have little to no training in botany, nutrition or healing practices in other cultures. They’re limited to their own specialty inside Western medicine and are not necessarily trained to look at the whole body, the bigger picture. He’s over 70 and still doing what he loves to do. When I lived in China, I learned that the most respected Traditional Chinese medicine doctors are those who are the most experienced. I prefer get advice from a doctor with decades of experience (and in still in good health) rather than from someone just out of medical school. Western medicine is set up to treat symptoms after you fall ill. It’s a sick-care system. If you want to do your best to avoid illness, focus on living a healthy lifestyle that may help you to prevent or delay the onset of disease or degenerative illnesses. Dr. Weil’s advice may help you do this. If you feel you need to speak with a specialist, you may want to make a call before you head to a doctor’s office. Check your health insurance plan to see if they have a nurseline. Each time you visit your doctor or check in at a hospital, you put yourself at risk of picking up germs, being coerced into taking prescription medications, being uncomfortable for hours in an emergency room, or going through procedures you could delay or avoid. Wouldn’t you rather avoid all this whenever possible? When you’re not feeling well, wouldn’t you rather get some advice online or make a phone call from the comfort of your bed rather than journey out to a doctor’s office? As healthcare continues to evolve, we’re more likely to see an increase in remote doctor-patient visits through innovative institutions such as FreeMD.com, DoctorOnDemand.com or CallDoc.com. One thing I especially like about CallDoc is that they offer discounts to natural therapy professionals. Humor is best thing for living . longer and better . Thanks for sharing this info.